Growing up, drinking the milk left in the bowl after eating all my cereal was a sweet treat! Two of my personal favorites were the milk left-over after eating fruity or chocolate cereals - these were also the cereals that we didn't get on a daily basis. Now, my two children enjoy the very same childhood memory! 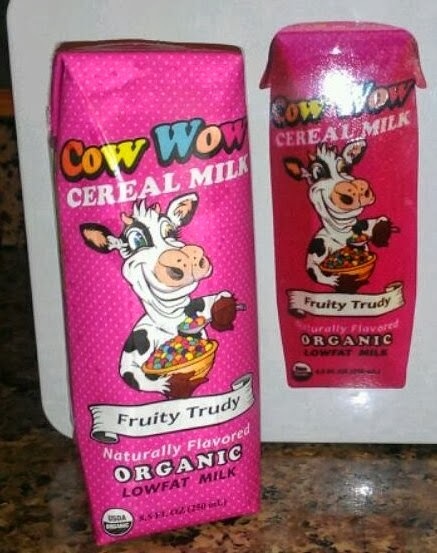 Cow Wow is a single-serve, ready-to-drink flavored milk that captures the unique and wonderful taste of the bottom of the cereal bowl. It’s the best part! With only 6 grams of added sugar, this delicious and nutritious dairy beverage is made with low-fat, organic milk and contains nine essential vitamins and nutrients and is a good source of calcium, protein, and potassium. 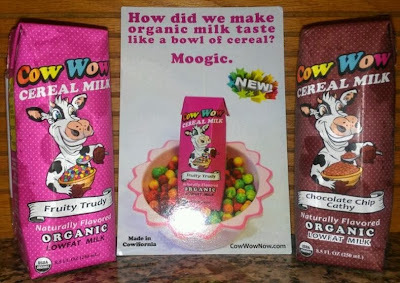 With Cow Wow, now moms can give their children the fun and flavor of a bowl of cereal in a convenient shelf stable package perfect for busy families on-the-go. Perfect for school lunches and after school sports! Both of my children (ages 9 and 12) are active in sports and after school activities. They also take a cold lunch to school every day of the week. As a mom, I want to make sure that I am sending them a variety of healthy foods to eat and drink each day. I also want to make sure that they are getting a healthy variety so that they don't get bored and stop eating what I send them. 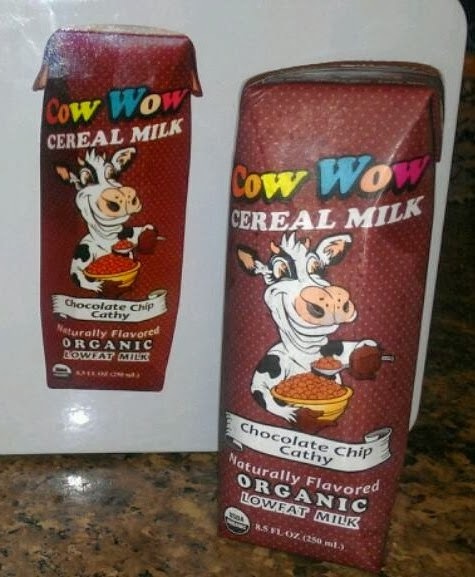 Q: How did Cow Wow make organic milk taste like a bowl of cereal? 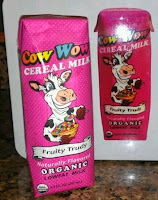 Cow Wow cereal milk is currently available in two "udderly" delicious flavors; Fruity Trudy and Chocolate Chip Cathy. They will also be introducing two new flavors very soon; Peanut Butter Bessie and Cinny Minny. I'm sure their names will give you some idea as to what breakfast cereal your Cow Wow shelf stable milk is going to taste like. Fruity Trudy is going to taste very similar to Fruit Loops, Trix, or Fruity Pebbles! Chocolate Chip Cathy is going to taste like Coco Puffs or Count Chocula cereal. My 9 year old daughter LOVED both flavors of Cow Wow milk and couldn't choose a favorite. My 12 year old son said that Chocolate Chip Cathy was by far the best, and that he thought Fruity Trudy was too sweet. 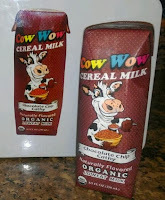 Since finishing our samples, they have both asked when I was going to get more Cow Wow cereal milk! What is favorite kind of flavored milk? Chocolate? Strawberry? Caramel? Vanilla? Oh my gosh... bottom-of-the-cereal-bowl-milk is the BEST! My kiddo would love to have it as a drink with dinner and not just as cereal left overs. I have not seen this milk before. I bet my son would love it! I'm a huge fan of shelf stable milk, especially chocolate. It's so perfect for lunch boxes! I like milk in my cereal but these just sound well... odd. I like regular chocolate milk though. Then again I'm sure that the intended market for these is kids and not parents! LOL! I'm definitely going to have to have my son try this! Oooh I totally do the milk in the cereal bowl thing too! I love chocolate milk. Shelf stable is SO handy to have in the pantry. I don't know why I have not purchased these yet for my kids lunches! Thanks for the reminder! I love that this is single serve and perfect for the school lunchbox. My son is 3 years old and would love these! My kids love chocolate milk. I'll have to see if I can find these in stores. Love that they are organic and shelf stable! Shelf stable would make these great for traveling too! !